Interior of SCP-3576 taken by Junior Researcher Ledzt, who believed he was photographing a 'Witch's Cottage', one of the more common structures simulated by SCP-3576. Road access has been restricted, with Foundation controlled checkpoints placed on the approach to the village of █████████. All other roads have been diverted with the assistance of the Belorussian government. Sections of SCP-3576 accessible via foot have been augmented with sections of 3-meter high fencing, and are routinely patrolled by two-man teams. Motion-sensing cameras have been placed at strategic locations along the distributed border fence line. As of 09/01/2014, no guard dogs are permitted within Site-233. The village of █████████ has been co-opted as a Foundation research site. The former residents have been relocated, and the area designated off-limits due to a 'Post-Chernobyl radiation flare-up event cover' as outlined in the Eastern European Operations Guide. Note: Site-233 is currently undergoing renovations to make room for a number of anomalous objects recovered in Operation Breached Curtain. Personnel are advised to keep noise pollution to a minimum so as not to interrupt the continued testing of SCP-3576. 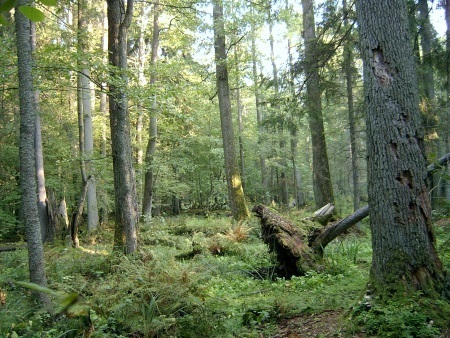 Description: SCP-3576 is an 8.5-9 km2 section of the Białowieża forest located 2.8 km from the currently Foundation-held village of █████████, Belarus. SCP-3576 is largely comprised of old growth pedunculate oaks (Quercus robur) and associated undergrowth, though SCP-3576 has a higher proportion of natural clearings than the surrounding forest, forming semi-connected areas of mostly open, traversable woodland. The south-eastern section of SCP-3576 can be most easily entered via a number of 'corridors' of overhanging oak, which serves to lead human subjects into the active area of SCP-3576. There are no human structures within SCP-3576, and archaeological examination has found no trace of human habitation in the last 5-6 thousand years. SCP-3576 enters an active state when a human unaware of its anomalous properties crosses the boundary of the designated section of woodland. Research into the viability of aerial insertions into SCP-3576 are ongoing. Within 5-10 minutes of a human entering SCP-3576, all mammals of sufficient mass (between 60-300 kilograms depending on species) at that time will be 'conscripted' into an SCP-3576 narrative, and are henceforth designated SCP-3576-1. SCP-3576-1 are comprised primarily of red deer (Cervus elaphus), roe deer (Capreolus capreolus), wild boar (Sus scrofa), Eurasian wolf (Canis lupus lupus), and Eurasian lynx (Lynx lynx). Due to their scarcity, the European bison (Bison bonasus) is less commonly converted into an instance of SCP-3576-1, though instances have been reported. SCP-3576 creates detailed, reactive narratives using instances of SCP-3576-1 and a perception-altering effect that disguises instances of SCP-3576-1 as human, or humanoid 'characters' to any human within the bounds of SCP-3576. Audio-visual recording devices are not affected by SCP-3576's anomalous effects, and as such the content of the narratives are known only from firsthand accounts. While a human subject sees, hears, and can even touch what they believe to be a woodsman, knight, noblewoman, or other characters, digital recording equipment perceives only an animal in distress, forced through unknown means to stand on its hind legs, and make simple vocalizations when the 'character' speaks. Additionally, SCP-3576 also creates props and sets in what is believed to be a similar fashion to the characters, providing the backdrop for each narrative in a style that matches early-modern construction and architecture of the area, though with an ornate quality that is shared by the outfits and appearances of SCP-3576-1. All language either spoken by instances of SCP-3576-1 or written on 'props' created by SCP-3576 matches the native or preferred language of the primary human subject. At this time it is unclear how SCP-3576 'chooses' the primary subject when presented with multiple humans at once, though initial testing does point towards factors such as creativity, confidence, and leadership skills all affecting the likelihood of an individual being chosen as the primary subject. Subjects that are aware of SCP-3576, and know the true nature of SCP-3576-1, are not affected by SCP-3576, and their presence will return SCP-3576 to an inactive state within 5-10 minutes of entry. Subjects that discover the true nature of SCP-3576 or SCP-3576-1 during the course of a narrative will cause a similar loss of activity. Instances of SCP-3576-1 that are 'released' before the intended end of an SCP-3576 narrative shown heightened states of distress and unpredictability, either attempting to flee the human presence within SCP-3576, or reacting violently to humans and other animals. These behaviors are consistent with wild animals in high-stress situations and are not believed to be a direct result of the anomalous effects of SCP-3576. SCP-3576 narratives last between 2-5 hours, depending on the actions of the subject. SCP-3576 narratives resemble a number of traditional local stories, though often veer away from the standard or expected end-point based on the choices made by subjects, and availability of SCP-3576-1. Narratives tend to form the following basic premises based on the number of animals within SCP-3576 at the moment of activation, though have been known to transition to more complex narratives if more animals, and thus SCP-3576-1 are introduced. 1-4 A prince, princess, or other young noble who must be led home. Often initially presented as a simple lost youth. 4-9 Two young warriors preparing for a duel, one of which must be prepared for the battle, and protected from assassins sent by their opponent. 9-14 A lost caravan transporting either a person, or object of great value is ambushed by brigands, and the survivors require help to survive. 14-23 A wedding between two people of some importance will take place, but is interrupted by a jilted former lover of one, or both of the intended, leading to conflict. 23-41 A ball or other gathering is taking place, but the host, worried about a possible attempt on their life, requires the help of an outsider to find the one or more conspirators who have come with malicious intent. 41- A pitched battle between two feuding houses over a failed marriage between them, which can only be stopped if the pair can be reconciled, or otherwise convinced to call off the feud. The tone and linguistic content of most SCP-3576 narratives has been described by test subjects as matching local folklore, and high drama. While no mental compulsions have been proven, subjects are often 'caught up in' the narratives, often engaging with the characters even when instructed to do otherwise. At this time, no severe injuries have been suffered by subjects exposed to SCP-3576 during the course of a narrative, though a number of injuries have been suffered by test subjects that cause a cessation of the active state. Instances of SCP-3576-1 who are wounded or killed within the fiction of the narrative are unharmed, despite injuries apparent to human subjects. Monitoring and dissection of former instances of SCP-3576-1 and human subjects have revealed no physiological abnormalities, though human subjects who complete an SCP-3576 narrative without causing SCP-3576 to enter its inactive state have reported experiencing minor shifts in mood and outlook for up to 6-9 months following exposure, both positive and negative. It is currently unknown if this is a direct result of the anomalous effects of SCP-3576 or a non-anomalous response to taking part in a narrative centered around them. Subjects have reported increases in confidence and creativity, with a small portion developing narcissistic or self-destructive tendencies, believing themselves to be 'important' or 'invincible'. A full psychological profile of former SCP-3576 subjects is currently being assembled. Note: The following interview was carried out on ██/██/2009 and comprises part of the debrief of the first Foundation asset to encounter SCP-3576. Interviewed: Agent J. Kowalczyk, attached to Eastern European recovery operations between 1998-2014. Dr. Harland: We'll have you back in the field as soon as possible, agent. I just want to go over your report with you. Given the nature of this object, your first-hand account may prove important. Agent Kowalczyk: Alright. Where would you like me to begin? Dr. Harland: The very beginning. What drew your attention to SCP-3576? You were doing routine information gathering in the area, yes? Agent Kowalczyk: That's correct. We're still cleaning up objects that fell through the cracks when the USSR fell apart. Some security guard leaves a GRU-P operated site when the pay stops coming and takes home a souvenir that kills his whole bloody village. Dr. Harland: You believe this may be what's causing SCP-3576? Agent Kowalczyk: No, no, that's just why we were in these tiny little towns nobody has ever heard of. We find someplace central, large enough to let a half dozen agents meet without getting noticed. That becomes a base of operation, and from there we split up and go check out the little towns in the area. I got █████████. Dr. Harland: Your report mentions local legends about the forest? Dr. Harland: This is a mister… Vadim Ivashka in the report? Agent Kowalczyk: Yes, that's him. He wasn't drunkenly retelling old stories, he had been telling anyone who would listen about something that had just happened to him a month or two ago. Apparently, a doe he was chasing had led him into an opening in the forest and turned into a beautiful woman. Told him stories about a hidden home deep in the woods, and how she had to be returned there before nightfall. He had lost his nerve and ran off an hour or so in, and been chased home by wolves. Dr. Harland: What reason did you have to believe him? Dr. Harland: Let's stay on topic, please. Agent Kowalczyk: Right, right. Anyway, Vadim didn't seem bright enough to make up some of the details I got out of him. I had him lead me to where it happened, and let him run back home. He was spooked, and I didn't need him freaking out and shooting something. I entered the area he had pointed out and set my lapel camera to record. Almost jumped out of my skin when I looked back over the video later. Took about… ten to fifteen minutes? I'm not sure exactly when I entered the area, but it would have been around ten to fifteen minutes after Vadim ran off that I met the boy. Agent Kowalczyk: Young man. Maybe 14, 15. Wasn't dressed for the right century, like a page or squire or… something like that. Grabbed at my coat and started babbling at me about how his master was injured, and I needed to come and help. Agent Kowalczyk: My family, yes, but I grew up in Maine. I think in English. Dr. Harland: Alright, please continue. Agent Kowalczyk: I think I covered the actual event well enough in my report. The burned carriage, the bodies. It was like walking into a set from a period movie, or out on stage. Very… Curated, I guess. I've seen what an actual ambush looks like, and this wasn't it. All these injured men were laid out where they could groan and show off their wounds as the boy led me in. Arrows littering the scene. Artfully placed. Dr. Harland: And that was when SCP-3576 ended its active state? Agent Kowalczyk: Is that what we're calling it? Yes, yes it was. I had a moment of realization, it all just lined up in my head that this wasn't real, that it was a show being put on for me and it collapsed. Suddenly I was standing in a clearing with a dozen deer, some of them balanced on their hind legs, most of them laying around. They all bolted at once. Dr. Harland: And the recording? Agent Kowalczyk: On the whole time. I returned to █████████ and checked the footage. Nothing. No carriage, no arrows, no wounded soldiers. Just the deer moving around, looking uncomfortable, making these mewling sounds like they were being held in place. But the boy was worse. He was a wolf, and when he was tugging at my coat the camera… The camera was right on the wolf's face. Eyes rolling, whimpering. Poor thing was terrified. Closing Statement: Following visits to SCP-3576 by Agent Kowalczyk returned no anomalous effects, now known to be due to the nature of SCP-3576 and how it interacts with knowledge of its properties. Agent Kowalczyk declined further involvement in research into SCP-3576. As of 2014, he has been acting as a liaison to the Duchów wing of the Polish government. Incident 3576-38-B: On 09/01/2014 a guard dog (German Shepherd) attached to one of the perimeter patrols around SCP-3576 escaped its harness and chased a rabbit into SCP-3576 before it could be recaptured by its handlers. At that time test-218 was underway, and the escaped dog became an anomalous variant of SCP-3576-1, hereafter referred to as SCP-3576-2 after entering the active zone. SCP-3576-2 did not integrate with the narrative underway. SCP-3576-2 successfully escaped the perimeter of SCP-3576 and is currently uncontained. SCP-3576-2 retained its anomalous properties on leaving SCP-3576, and its retrieval is considered a top priority for agents operating in Belarus, Poland, and surrounding areas. SCP-3576 has been updated to Euclid status. 1. The Chernobyl Nuclear Power Plant Zone of Alienation. See document CH-0331 for more information on Foundation operations in the area.